Basecamp Classic: How do I add the iCalendar feed of milestones to my Google calendar? This is where you will paste the URL of your Basecamp milestone feed. 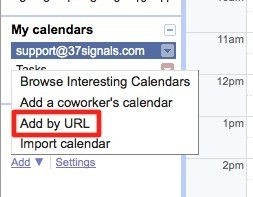 To get that URL, you simply want to right-click the “Global iCalendar” link at the bottom of the Dashboard tab and choose “Copy link” (or a similar option). This is the URL you’ll then paste into Google calendars.